In this interview, Yoshiaki Suzuki, Executive Director of the Wireless Communications Department at the National Institute of Information and Communications Technology (NICT) and former Chair of the editing committee for this magazine, talks with Mrs. Pascale Sourisse, President and CEO of the Alcatel Alenia Space. Mrs. Pascale Sourisse, President and CEO of the Alcatel Alenia Space shares her thoughts on future space development strategies, the need for hybrid satellite networks and other issues. "INMARSAT Fourth Generation Satellite And BGAN Service"
The data communication demand on the Internet has been rapidly expanding and the terrestrial data communication bit rate has become extremely fast by the spread of broadband access lines such as ADSL. The data communication speed of 144kbps has been the highest in the field of the mobile satellite communication so far. INMARSAT launched the next generation satellites from the hope for further speeding-up of the data communication also in the mobile satellite communication in the future. In this article the outline of INMARSAT fourth generation satellite newly launched and BGAN service are described. I am pleased to imagine that university students all over the world will jump with deep emotion when they hear a voice from their hand-made satellites. At the unforgettable moment upon receiving a signal, one student said that he felt impressed "as if tears were coming from each cell in his whole body." I believe that facilitating young people to experience such glorious moment leads us along a narrow path to a better future." Ms. Rei Kawashima, University Space Engineering Consortium, which was established to facilitate and promote practical space development activities in universities and colleges, describes her experience from the International Space University to student's micro-satellite projects such as CanSat and CubeSat..
"21GHz-band Satellite Transmission for Super Hi-Vision Broadcasting - Topics from NHK STRL Open House 2006 - "
NHK STRL Open House 2006 was held from May 25 to the 28th. 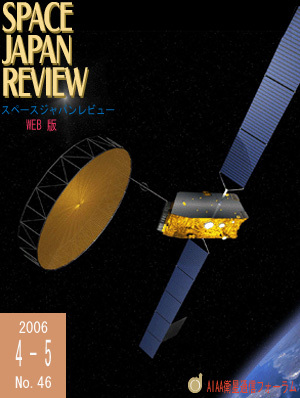 The theme this year was "Expanding the Horizons of Broadcasting with Trustworthy Technology", and 30 items of the latest study results on "Ultimate Broadcasting System Conveying a Strong Sensation of Reality", "Advanced Content Production and Agile News-reporting systems", "Ubiquitous and Universal Services", "Rapid Progress of Digital Broadcasting" and "How NHK�fs R&D Benefits Society" etc. were exhibited.